The Bank of Canada issued the new $10 bank note featuring the Canadian Museum for Human Rights and Viola Desmond. See photos here and here. For more information, see here, here, here, here, here, and here. The Asper Foundation is proud to launch the 2018-2019 Human Rights and Holocaust Studies Program for grades 7 to 9 students from Canada. For more information, click here. The Asper Foundation’s award-winning Human Rights and Holocaust Studies Program has reached over 14,000 youth across Canada promoting understanding and sensitizing students to the consequences of racism. For more information, click here. The Asper Foundation is pleased to unveil the new website for Human Rights & Holocaust Studies Program in time for the program’s 18th year of operations. THE HUMAN RIGHTS & HOLOCAUST STUDIES PROGRAM GOES GREEN! With very large numbers of high school students and chaperones from across Canada having travelled to Washington, DC and now travelling to Winnipeg, MB annually through The Asper Foundation Human Rights and Holocaust Studies Program, the Foundation recognized the real need for the program to help alleviate the effects of its share of carbon dioxide emissions. The program has established an annual contribution to charitable organizations that plant and care for trees. A donation has been made to Tree Canada, a not-for-profit, charitable organization. As well, a donation has been made to the Jewish National Fund of Canada’s Go Neutral program. This year’s program donation will result in the planting of almost 1,200 trees which, when fully grown, will provide daily oxygen for up to 4,800 people and release up to 540,000 litres of water daily into the air. Please click here for program recognition from JNF Canada’s Go Neutral program and Tree Canada. 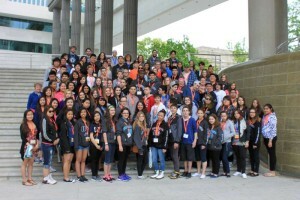 From 2001 to 2018, over 1,000 Aboriginal students from every province spanning British Columbia to Newfoundland and Labrador as well as the Yukon and Nunavut territories have participated in The Asper Foundation Human Rights and Holocaust Studies Program including students from Winnipeg’s inner-city and communities such as Six Nations of the Grand River First Nation, ON, Norway House Cree Nation, MB (Kinosao Sipi Cree Nation), Cross Lake First Nation, MB (Pimicikamak First Nation) and Opaskwayack Cree Nation, MB. The Asper Foundation has directly contributed almost 1.9 million dollars for the participation of these students.